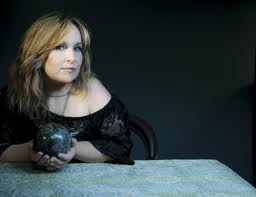 Almost twelve months to the day that Gretchen Peters brought her Hello Cruel World Tour to the Midlands, the esteemed Nashville-based singer-songwriter returned to the area to resume the next phase of her career. With no Robin 2 Biston gig on the itinerary this time, the slightly longer trip to the elegant Assembly in Leamington Spa was made to witness Gretchen, and her now two regular touring companions Barry Walsh and Christine Bougie, entertain a mixture of old and new fans. On the previous tour, Gretchen elected to play the most successful album of her career in its entirety and in a very systematic track order. So in a celebration of a return to spontaneity from an audience perspective, this gig review is to adopt a highly structured format and reflect in admiration the unpredictable set list from the evening. Woman on the Wheel – Not only in my opinion was this the finest track on HELLO CRUEL WORLD but Gretchen decided to name this latest tour in honour of it. I never tire of listening to this song with the immortal line ‘one false move and it’s a real bad day at the amusement park’. The upbeat nature of this song got the evening off to a perfect start. Sunday Morning (Up and Down My Street) – No messing or intro and it’s straight into one of the standout tracks from the BURNT TOAST AND OFFERINGS album. There is just something special about country music and Sunday morning songs, reference Kris Kristofferson. This pushes that classic close. The Matador – It’s definitely no HELLO CRUEL World in chronicle order tonight as we have the delightful ballad that delves into the controversial world of that Spanish gladiatorial tradition. A wonderfully well constructed song that continues to grow with each listen. Dark Angel – In a couple of months time Rodney Crowell will be gracing UK stages when appearing with Emmylou Harris, so in the meantime Barry continues to ‘ably deputise’ in another of my favourite HELLO CRUEL WORLD tracks. This fine album shows no let up yet in its impressive live rendition. Guadalupe – Gretchen never shies away from her absolute admiration of this song and it has long become a set favourite. Maybe one day we may see Tom Russell join her on a UK stage for a performance of what’s set to become a western classic. England Blues – Amongst all the ballads, Gretchen still shows she can rock a little bit as, with great personal delight, this ode to the right side of the pond makes a welcome return to the set. You can even sense a touch of toe tapping from the refined Leamington Spa crowd. Independence Day – The wrong of this all-time classic being omitted from last year’s set is corrected tonight. As intimated on social media sites, Gretchen has freshened its live performance up with a keyboard delivered slowed down version that still contains all the passion of the 1995 CMA Song of the Year. The sky was still lit up on that 4th of July. Circus Girl – Another long standing song of Gretchen’s which has seen her re-evaluate and re-visit. In my opinion it has always been in the shadow of the avalanche of classic songs that have subsequently flowed from her pen but still an enjoyable song to hear live. Gretchen’s Theme – The time arrived for Gretchen to leave the stage and let husband Barry take the spotlight. This time he chose an instrumental that had recently been used in the closing scenes of a Dutch film. You could feel the cinematic vibes from the keyboard sound of Barry and the support by Christine on her array of rhythmic instruments. Hello Cruel World – Gretchen reappears after one song to deliver the title track and opener from what has become her eponymous album. This song will always be associated with being at the forefront of the album listen so its new mid-set location was a little unusual. Saint Francis – As per usual Gretchen displayed her natural charm with some astute observations from the perspective of a constant travelling musician. She openly admitted to preferring churches with musical connotations i.e. The Cavern, before delivering this track from HELLO CRUEL WORLD. Return of the Grievous Angel - Americana heaven as Gretchen is joined by support artist Ben Glover to deliver this Gram Parsons classic. There can be no finer way of honouring the approaching fortieth anniversary of his sad demise especially on the eve of South by South West and the increasingly hip Couch by Couch West. Five Minutes – There was no holding back on Gretchen’s adoration of the English period classic Downton Abbey. Tonight we found out that this outstanding track from HELLO CRUEL WORLD is a firm favourite of actress Elizabeth McGovern (aka Sadie and the Hotheads in music circles). This precisely titled song always leaves its poignant message. Idlewild – There is no extended prelude to this highly personal track from HELLO CRUEL WORLD tonight, just the pure pleasure of listening to its superb lyrical content in an environment where you could hear a pin drop. Breakfast in Our House – Gretchen often refers to BURNT TOAST AND OFFERINGS as her ‘divorce’ album and she is keen to feature a number of tracks in this performance. Having witnessed Gretchen appearing solo around this time, the seemingly new settled format including Christine delivering some sublime lap steel has profoundly enhanced her live show. On a Bus to St. Cloud – Absolutely no introduction needed for what is probably now regarded as her most popular song. While Martina McBride’s version of ‘Independence Day’ and Faith Hill’s ‘Secret of Life’ added value to Gretchen’s songs, Trish Yearwood’s cut never came close to the original. To Say Goodbye – The end was nearly upon us as this song, yet another one drawn from BURNT TOAST… , is now becoming a regular way of winding the live performances down. Although occasionally a twist follows..
Wild Horses – This much covered song was delivered by Gretchen in duet with Otis Gibbs in front of the infamous peacock backdrop at last year’s Maverick Festival. Ben Glover made a final return to the stage to assist on this occasion after proving to be a very capable support artist at the outset of the evening. So this evening really closed the circle of HELLO CRUEL WORLD. More of the back catalogue was re-integrated into the set and now we wait eagerly for the next phase of Gretchen’s career. With no indication of upcoming new material during the evening, there may be a period of re-grouping. The quality bar is constantly being raised but there is little doubt that Gretchen Peters will meet this challenge in the future.